Recent Funeral: it came as a shock to our parishes and to our island community to hear of the sudden and peaceful death of HECTOR MacNEIL (Eachann Dhomhnall Ailig of Tangusdale) on Monday 8th April. Eachann passed away aged 74 in his own home in Tangusdale. Eachann was such a well known and well loved character of our island having his own bus company-which was a familiar site on our roads for so many years. Also Eachann was a familiar face in St. Brendan’s Church in Craigston- always there setting up for Mass, making sure the heating was on; helping to organise readers & Eucharistic ministers & also people for the offertory procession. Eachann himself was a Eucharistic Minister, such was his love for the holy Mass, he was able to serve the Lord at the Altar as a Eucharistic minister- which he did with great faith and humility. Eachann was a man filled with faith; a good, dependable man who just got on with things without any fuss. Eachann loved his faith, his family and his island. He will be sorely missed. We extend our prayers of love and sympathy to Ceitag and all the family at this sad time. Eachann’s Requiem Mass took place on Thursday 11th April in St. Brendan’s Church and Eachann was then laid to rest in Cuithir Cemetery. Fois shìorraidh thoir dha a’ Thighearna agus solas nach dìbir deàrrsadh air; gu robh fhois ann an sìth. Amen. 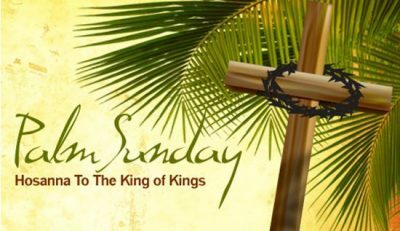 Holy Week: we now enter the important week of “Holy Week”- from Palm Sunday to Easter Sunday. Please note the Mass times -especially for Holy Thursday, Good Friday, Easter Vigil and Easter Sunday. Fr. John Paul and & Fr Emmanuel will share out the Masses but will unite for the Easter Vigil in Craigston. We are encouraged to embrace Holy week and do our best to attend the Masses and so prepare ourselves for the graces and blessings of the great celebration of Easter. Volunteers for Washing of Feet: On Holy Thursday, the Mass of the Lord’s Supper in Castlebay church- part of the Mass will be the “Washing of the feet”. We are looking for 4 or 5 men to volunteer for washing one of their feet during the Mass on Holy Thursday in Castlebay. Let Fr John Paul or Fr. Emmanuel know if you would like to help. Sacrament of Confession: please note the the times of Confession during Holy Week- Monday in Vatersay from 5pm-6pm. Tuesday in Eoligarry from 4pm-5pm. Wednesday in Craigston from 6pm-7pm. Thursday in Northbay from 10am-11am. Good Friday in Vatersay from 10am-11am. Holy Saturday in Castlebay from 10am-11am. SCIAF: this weekend we had the parish fundraising Coffee morning in Castlebay School for SCIAF. We also have with us Teresa & Penelope who work with SCIAF and they will be at the vigil Mass in Craigston and will say a few words during the Mass on behalf of SCIAF. SCIAF Wee Box: On Holy Thursday we normally bring our SCIAF Wee Boxes to Mass. So if you could start to bring to the “wee boxes” to the church from Holy Thursday onwards. Many Thanks. Stations of the Cross: today Sunday 14th April there will be Stations of the Cross in Castlebay at 4pm. Visit of Bishop Brian McGee: On the weekend of 27th/28th April Bishop Brian will be making a parish visitation. Each year Bishop Brian visits every parish. He celebrates the weekend Masses. He visits the schools and some housebound and visits the Home & hospital. 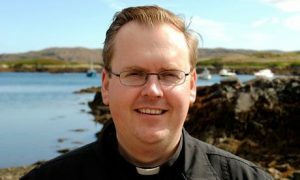 We look forward to welcoming Bishop Brian to the parishes. That weekend will also be Divine Mercy Sunday and so on the Sunday afternoon a Special Rosary will be prayed with Bishop Brian.